Saipan, Very Dear to our Hearts! Just a quick statement about the 26 hour passage events. It was WET, bouncy, 2 drawers jumped out of their places, two anchors on the bow, 200′ of our anchor chain was still in the chain locker- forgot to pull it down into the bilge and the remaining 50′ slid forward to the forepeak within the bilge. In our hasty departure out of Guam we forgot to batten down the V- berth hatch and hadn’t discovered it until everything was sitting in a large puddle of salt water! We were fully loaded with fuel and water, bikes, SUPs, and lots of provisions. The heavy bow combined with short period 6-8′ very steep waves, close hauled and we were diving with full bowsprit into the water. As we pitched upward the green water gushed down the leeward side where we sat. Sue hailed us about 20 miles into the passage and asked if we wanted to turn back as they also pitched downward and also had water running down into their cockpit. Gushers filled the cockpit, there wasn’t a dry spot left, the port lazarette filled up a couple of times. John hand pumped the water out. We were soaked beyond comfort, Only good thing it was still warm outside. 26 hours later, we entered the calm harbor and tied to the large ferry dock with SV Ouistitis and SV Dionne. Non potable clean city water and 110 30 amp electricity were free on the dock but no showers or toilets available. $8/ day dock fee, no Harbor or Customs fees. 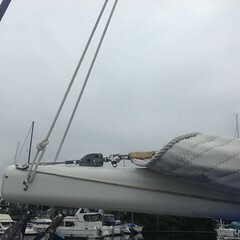 We immediately hosed ourselves, removed the entire contents of the V berth and stacked it on deck. 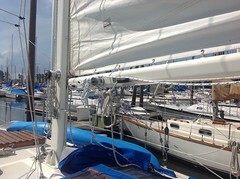 It took nearly 8 days to dry the hosed out cushions, we looked like traveling vagabonds as we slowly repacked the boat. 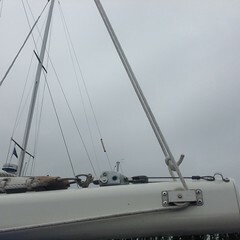 We left our 45# CQR on the dock, our new friend Moon, took it home. Good riddance to a broken, worthless anchor – email us if you want to know more about that mess. So onto the part of our wonderful Saipan adventure. We met absolutely, incredibly generous and beautiful friends from all over the world. Saipan isn’t a cruising destination as most boats heading to Japan stop in Guam to provision and boogie on. For those cruisers who take the time to travel the additional 120 miles northward, the rewards of the people, culture, history and geography is beyond imagination! The dock is located in the channel so all the tourists from China, Korea and a few Japanese board the ferries outbound to the luscious islands around Saipan where the water is beautiful aqua blue, turquoise green, the diving and snorkeling are pristine and the very fine white coral sand is like powdered sugar. It was on the dock where we met all our new friends. At the lower left corner you can see two masts, Konami and Dione. Ouistitis is in the middle of the lower half of the picture. The first set of friends – Mike an American, and his gorgeous Indonesian wife, Nora stopped by and we began talking about boats. 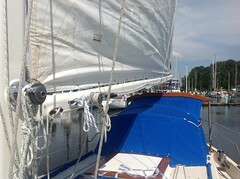 Mike has a 40′ TaShing sailboat in Maryland currently undergoing a refit for near future cruising. Nora sailed as crew so has a good background and knowledge. They immediately offered us rides around the island, sites of WWII war and peace memorials, took us to a great breakfast shack. BBQ at their condo poolside, and spent time just hanging out together. Nora drove us where-ever we needed to go, to process our check out papers and last minute fresh food provisioning. Our next set of friends – Dave, an American Tugboat Captain working between Marshall Isl and who also owns a sailboat in the Saipan harbor, and his lovely Thailand wife Kwaye Pronounced Gale, brought us dinner and offered anything we could possibly need during our stay. Randy, an American who is First Mate on the Tugboat and his Thailand wife Cindy, ran John and Glenn around town getting fuel, looking for boat parts, had potable water delivered to our boat, brought us Mickey bullet beers, dinner, fresh fruit and all around great conversations. Nida, our new Phillipina friend is Operations Manager at the Hard Rock Cafe in Saipan brought out the best Nachos for us since Mexico! We enjoyed Nida so much, I hope we meet again in San Francisco where her mother lives. I think we melted our credit card buying T shirts for the grandchildren, and of course a few items for ourselves. Can’t wait to wear my Saipan shirt in the Tokyo cafe! Ron, an American who owns his software consulting company and his delightful, totally non-stop moving Thailand wife Moon, a former restaurant chef, brought us home cooked meals beyond words. Lemon grass chicken, lime leaf curry with chicken, I wish I could have some now. I have a bag full of dried kefir lime leaves from her tree and a gallon bag full of lemongrass from Gale’s garden. Ron took John and Glenn out to the Forbidden island where they enjoyed cave swimming and around the reef. Most of our new friends either spend time together or are acquainted. There were so many other people, mostly strangers that touched our lives and made us feel so at home and generous with fresh fruit and home cooked meals. We had people stopping by the boat at 8:30 a.m. until late afternoon. Between touring around the island, spending time with our new friends, Glenn and Sue, and the French cruisers Eric and Marielle, we were never on the boat long enough to cook anything other than breakfast. By far, Saipan is the most beautiful island we have visited. The coastline is stunning with shear line cliffs, pristine water, limestone and coral mountains, coconut lined white sand beaches where you can wade out nearly 200′ and still be waist deep in clear warm water. The highways are well maintained, better than the Portland area. The streets and roadsides are clean despite the abundance of tour buses and thousands of tourists similar to Hawaii. Surprisingly, we didn’t see many American or European tourists, aka Howlies. Perhaps the airline tickets are cost prohibitive? As an American citizen we can sign up for a PO box and become a permanent resident. A 2 bedroom fully furnished condo is roughly $750/month! Food is relatively cheap, and locally grown. Beef is a little expensive as its imported, but beef raised on Rota, a nearby island is high quality and delicious. We didn’t see a fish market but we weren’t cooking dinners either. The Carolinians, the original inhabitants and Chomorro natives no longer maintain their national heritage cultures with festivals or community awareness like Guam. Its very unfortunate to lose a culture after the last generation has moved on. We asked about any possibilities of viewing or meeting someone who could give us background information. We did attend first Thursday celebration in the city park. A group of young Carolinian men performed their traditional voyage dance with native costumes. After a few dances volunteers within the audience were asked to come up on stage and give it a try. John and Glenn and a few other men were pulled up and gave their best 20 minute performance. Having danced well in front of a hundred people they were rewarded with a palm frond headpiece that symbolized God’s power and protection for their voyage. We saved John’s headpiece for our boat. Moon brought her signature lemongrass rice, we purchased a yummy roasted chicken from the Asian food vendor and we all sat on the lawn with our dinner and drinks. A terrific fun and warm evening. Sorry, I don’t have the pictures yet. The night life comes alive with tourists, great restaurants, clubs, and numerous massage parlors where young Chinese women stand outside their glass front windows with the visible massage chairs inside. Ahem, gotta wonder about some of them. John and Glenn didn’t appear to be too interested with Sue and I standing nearby giving them the stink-eye. Nora took us snorkeling at the grotto cave. There is no place to leave your shoes or belongings so don’t take anything, you must walk barefoot. The blue water is so clear and colorful – you can see the giant coral bed nearly 30′ below. the ocean water comes in from the cave openings at the oceanside but you can only see intense blue light as you snorkel around the edges of the cave. The stalagmites hang down from the cave ceiling about 15 -25′ above the waterline. The incoming current and waves around the 7′ jump off rock is very intimidating. A lifeguard stands on the giant rock across from the cliffside and gives the signal to jump across the gap. The rope going across the gap is your only lifeline of making it safely across if you jump at the wrong moment. The lifeguard in the water below the rock signals when to jump into the sea. Glenn went first, I nearly slid off the rock rather than jump, I was so afraid but felt compelled to be brave. Nora went in after me, she’s a scuba diver so no fear, John was last. The water surges with such force it pulls you outward from the rock towards the back of the cave where the water comes in 30′ below. Getting out was easy, kick hard back to the giant rock platform and the natural large steps on the side are manageable even with flippers. Getting back to the cliffside rocks are the same current and crashing waves and need to be negotiated carefully. Its free and worth the effort of climbing barefoot back up the long concrete staircase in the cliffside. Mike and Nora drove us to The Bonzai Cliff over the ocean and Suicide cliff, the memorials were quite moving. A tremendous amount of lives lost on both sides, civilian women and children were told to jump rather than submit to the “ferocious treatment” by the American Army. Large caves in the face of the limestone mountains and where the large gun shells struck the cliff, the limestone turned white, are still visible. The natural erosion has created a grotesque mask- like face on the mountainside, almost a natural memorial of war horrors. From the top of Mt. Tapochau, the 360 degree view of Saipan and nearby islands are excellent. The various blue and turquoise colored water, white sand, and cool breeze are beautiful, one could sit for hours and stare out beyond the fields below. There are war remnants left there also, a juxtaposition to all the beauty. The day before we departed a young Chinese woman asked if we would take her and her mother out to the island for a snorkeling adventure. I explained that our boat was too big and there wasn’t enough water under the keel to get close. I invited them aboard and gave a tour of Konami. They were stunned that we had sailed from the US. And even more stunned that they had the opportunity to see our boat. 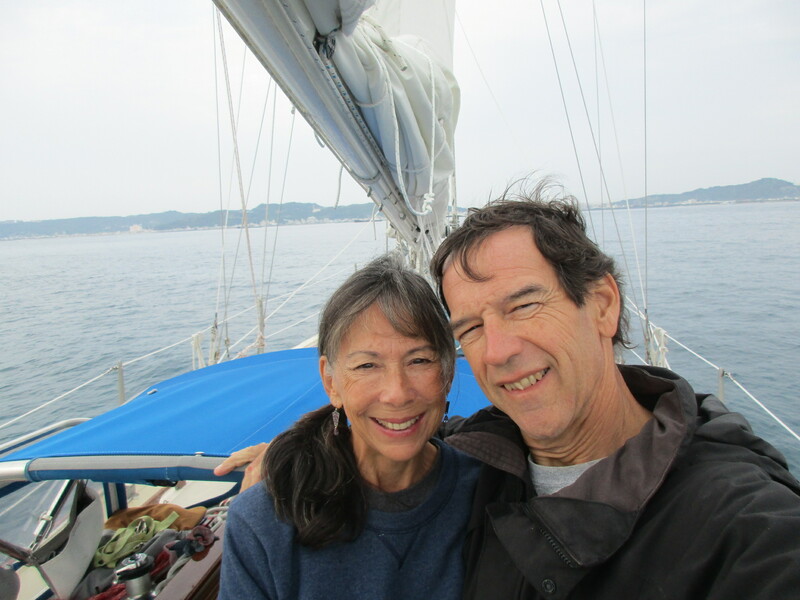 They were impressed with our gimbaling stove, refrigertor, the amount of food and water,the engine, and the fact that we sailed it with just the two of us aboard. She took lots of pictures with us to prove to her friends that she actually spent time on a sailboat. A “rare experience” as she put it for a Chinese person. They hugged me goodbye and couldn’t thank us enough. Each day I found myself becoming sadder as time with our new friends came to a close. Saipan is definitely a place to live for a few years. Perhaps the tourists and congestion would get old but there are places to live where its peaceful and beautiful. Stay out of downtown and its perfect. We hope to meet all of our friends again in Saipan. These experiences of meeting total strangers and sharing a few precious days or just a few moments with the Chinese mother and daughter are so heart warming and fulfilling. We’re so lucky and Grateful for our adventure, for each other, and our supportive families and friends. AND our really awesome Konami! Wish we could upload all of our really cool pictures, the wifi at McDonalds just isn’t fast enough. Roundtrip airfare from Japan is reasonable -$418 and even cheaper from China and Korea, about $200, so if you have the opportunity to travel anywhere in Asia, try to include Saipan. You won’t regret it. Me on my fun folding bike at Suicide Cliff. The concrete pad in the background was the latrine left over from the Japanese WWII post. Pretty cool to have that left over. We jumped to Japan and will get back with Guam and Saipan. If you go anywhere, go to Saipan, especially by sailboat! We had a decent passage from Saipan. 1250 miles, we calculated 10 days minimum, 12 at most. We literally skipped the boat across the waves, sometimes sailing fast over 7.4 knots with all 3 sails, the main and yankee partially reefed. 150 miles, 130, 120, our daily counts were going down along with the waves. The first 3 days were incredible sailing, a little bouncy, a few waves broke over the top sending water to the radar height – 15 feet up the mast, over the dodger, and only one cockpit gusher, but it was gloriously dry compared to the Saipan and Guam passages. Quistiti, the French 43′ steel boat passed us the first night out but we maintained email contact with them, about one day ahead of us. At one point we made 15 miles in 8 hours going horizontally rather than towards Japan, it looked like we were heading to Taiwan on the chart. We motored quite a bit as we headed into opposing 2 knot current and lught wind. Our forward boat speed dropped to 1.5 kts with 2000 rpm. At this rate we began to calculate our fuel burn as the wind continued to wane and the next two day wind forecast was diminishing even more. We couldn’t maintain our rhumb line, the wind was clocking around so quickly and lightly, the sail changes and tacking became exhausting. Recalculate the fuel burn. 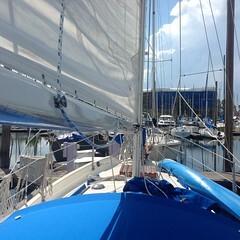 The temperature dropped dramatically, No more minimal clothing sailing. Jackets, wet pants, socks, coats all a mess down below as we changed each time to avoid sleeping in a salty bed. Salt was layered over the boat, lines, and cockpit. Konami appeared to be covered in diamonds. The wind forecast became unpredictable. A small High front which we were in, sandwiched between two passing low fronts, then a massive high with fast wind. And when we finally got through it after heaving to 135 miles out from Okinawa, we were ready for the passage to end. A hangup in email, lack of satelitte phone, and “proper” entry clearance into Japan had us hove to for another 24 hours, 15 miles off the coast of Okinawa as we waited for our information to be processed by the Japanese coast guard. All was good, we cleaned the boat, cold showered in the cockpit in 60 degrees, and rested up for our grand entrance into Japan. Here we are in full dress, make up with earrings, and clean shaven. Our dream come true realized 21 months after leaving our hometown Portland, how could anything mess that up? And during our passage, our twin grandsons were born. All went well, Mom and babies were doing well, not sure about the Dad, perhaps in a daze? Jittery, excited, nervous about communicating, eating great food, and most of all- seeing our families coming from home in just a few short 3 months. The Yonabaru marina is world class with every amenity possible, we have everything here, except wifi and money. We spent the first 3 days with Eric and Mariella, the French couple and their girls traveling to Naha via bus to finish off Customs, immigration and permit processes. My Japanese speaking ability is slowing starting to revive itself. I can ask the bus driver if the bus is going to where we want to get off. My reading skills are also starting to focus, So many squiggly lines! The first morning after we arrived I was just too excited to sleep so at 5:30 a.m. I went walking. And in the park near the marina was a group of people my age, performing the “radio exercise” routine. Well I just walked right up, stood and watched until one member noticed me and invited me to join them. 18 new friends, all excited to meet me, hear that we came by a sailboat, and very curious about my heritage. Needless to say, the last two weeks have been spent with them every morning exercising at 6:00 a.m., taking them out for a ride on the boat – a very rare experience for the average Japanese, eating delicious home cooked Okinawan food that included pig’s innards and feet. We loved the flavor, but something I probably won’t include in my future cooking repertoire due to the texture of the softened cartilage. We have been surrounded with incredibly heart warming people who are not just ordinary kind Okinawans. Our new friends include famous masters of Okinawan dance, opera singer, composer, Japanese calligraphy teacher, hand craft designers, Chef, and Shamisen teacher. The French people have been included in our gatherings and the Japanese people just don’t stop with gifts and parties. Yukiko, a woman in the group from Osaka speaks English very well. She has become a very close friend has been our lifeline. She drove us to the airport at the far end of Naha to get a sim card for our phone so we finally have expensive wifi. $55 for 3.2 gb with a 30 day expiration date. And between my sister managing our legal affairs and good friend in Tokyo who wired us enough money to last for a couple of months, we no longer need the $45 cab ride – one way- to withdraw cash from the only 7-11 ATM machine in Okinawa. Amazing! So here we are, we hugged our dear friends with tearful goodbyes with hope of meeting again, riding our terrific folding bikes all over town, we’ve finished our paperwork, caught up on making google earth charts for the fishing ports between here and Kyushu, and waiting for this small low front to move off. We and LeOuistiti are headed for the Kerama islands about 35 miles off the west coast of Okinawa, a World heritage park also known as the “blue water” islands. We are scheduled to haul out in Nagasaki May 15 for 2 weeks for a much needed bottom paint, rebed some leaky through hull valves, wood work and general maintenance to get our lovely Konami back to her grand state. Dione went to Chichi Jima, north of the Marianas. We will meet up with them in the Nagasaki boat yard painting side by side, and continue together from there. And by the way, the harbor master said he heard from other Japanese sailors that the Westsail boat is the best boat for traveling around the world, it can go anywhere, safely.